The movie is expected to draw enthusiastic crowds across Asia after its box-office bonanza in the U.S. 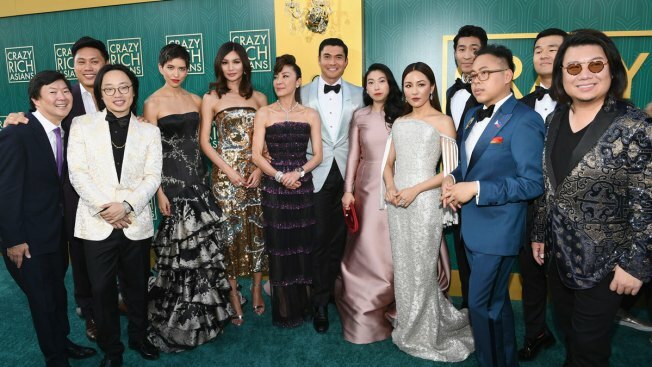 The craze for "Crazy Rich Asians" is hitting Asia, with a premiere in Singapore followed by openings in several neighboring countries later this week. Much of the over-the-top romantic comedy was set in this wealthy city-state. As the stars streamed past flashing lights down the red carpet Tuesday evening, local fans and tourists swarmed around them taking photos and asking for selfies. "This (movie) is something very personal to people, and it feels like a bigger movement than just the movie itself," Chu, the director, told The Associated Press. As is true anywhere, in Singapore, the super-rich with their extravagant lifestyles are a tiny, privileged minority. Many in Asia looked forward to seeing some familiar faces. In Manila, the Philippines, an audience of mostly movie writers, critics and bloggers and some celebrity guests were thrilled and applauded when two Filipinos in the film, Kris Aquino and Nico Santos, appeared in their roles during an advance screening Monday night, said Ruth Navarra-Mayo, an editor of the Lifestyle section of the newspaper Philippine Daily Inquirer. Santos plays a fashion designer. Aquino, a popular actress and daughter of late pro-democracy champions in the Philippines, played a member of Malay royalty. A former American colony, the Philippines has a highly Westernized culture and Hollywood movies are a local entertainment staple. Audiences would welcome more films with Asian themes and characters, Navarro-Mayo said. "We want to see Asian actors on Asian topics," Navarro-Mayo said. "We're hungry and ready for this type of film."